I start copying the links to see where they go. The next one's the same. 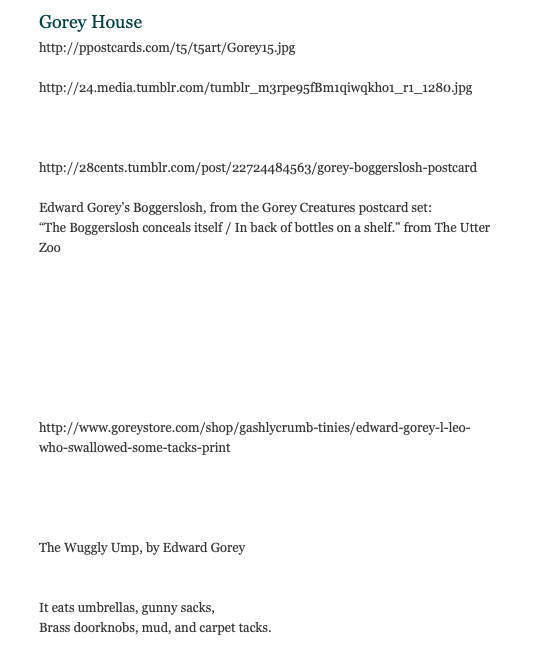 So's the third - although the third one tells me the image is the Boggerslosh, from The Utter Zoo. 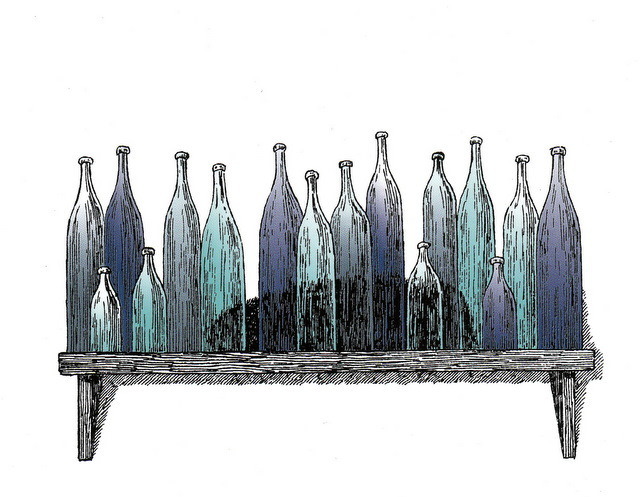 In back of bottles on a shelf. I fell down the Boggerslosh rabbit hole because I'd bought a book of postcards when visiting the Gorey house a few years ago. The Boggerslosh is the only postcard that I didn't mail off to someone. 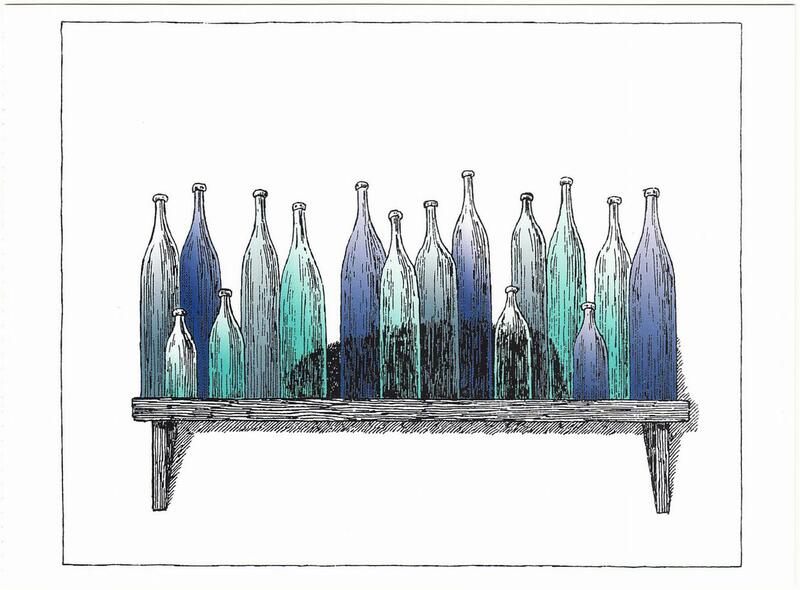 I kept it because it reminded me both of my mother (who was fond of blue & green glass bottles) and of the Gorey house (with its collections of oddments and glass bottles). 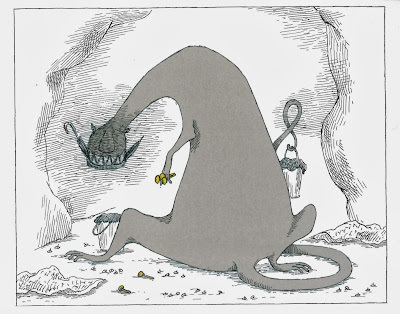 I decide to check my Gorey library. 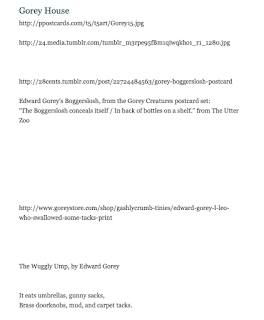 I do not have The Utter Zoo - and it is not included in either Amphigorey or Amphigorey Too. A nonsense verse or composition - a rigmarole with apparent meaning which proves to be meaningless. A succession of confused, meaningless or foolish statements; prolix and rambling or incoherent talk. Document having many names or seals (i.e. 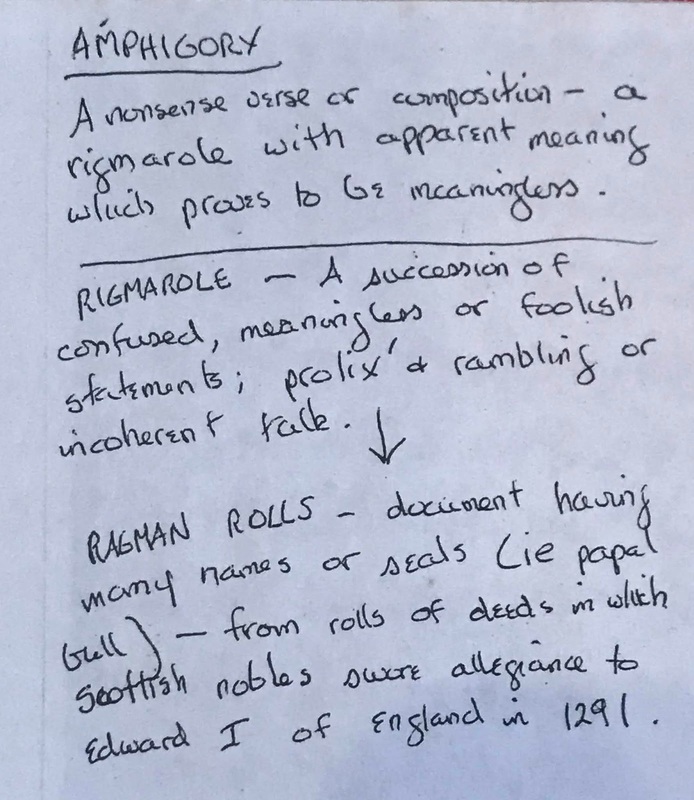 Papal bull) - from rolls of deeds in which Scottish novels swore allegiance to Edward I of England in 1291. 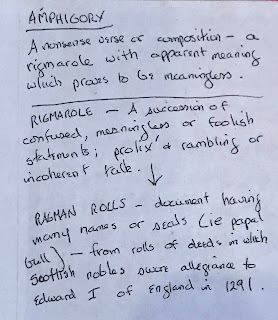 I do not remember discussing rigmarole and ragman rolls with my mother, but I love knowing that she cared enough to look up amphigory and follow it back to Edward I.
Aimless archeology paused, I return to the draft post. Brass doorknobs, mud, and carpet tacks. The Wuggly Ump is in Amphigory, but - sing tirraloo, sing tirralay! - I also have a battered 1963 hardcover, complete with dust jacket. What I cannot find is the photo I took at the Gorey house, of the small pile of carpet tacks on a mantelpiece. I know it's here somewhere. Even some of Gorey’s most ardent fans assumed he had to be British and long deceased. Such intricate, gothic scenes were supposed to unfurl from the pen of a wan, wraithlike neurasthenic holed up in a garret — not some towering Midwesterner partial to floor-length fur coats and busy days attending the New York City Ballet. Even though I generally don't love biographies, I might need to put that one on my Christmas list. I meander here, I meander there. And thus concludes a month of posting, nearly every day.